Boris wins with a landslide in "Facebook election"
An analysis of Facebook groups shows soaring support for Boris, active dislike for Livingstone and a complete lack of interest in Paddick. An official Boris Johnson politician page which comes with campaign videos, favourite books etc was launched a week ago and already has over 1,500 members. A more long-standing politician page has almost 2,500. One of the many unofficial Boris profiles has 1,000 friends. Two groups both named Boris Johnson for Mayor of London have 4,500 members between them. And largest of them all, the Boris Johnson Appreciation Society group has 13,600 members. There are a few hundred other groups about him, with only a very small being negative about him. Apart from the groups etc, there is a BackBoris application that almost 3,000 people have featured on their personal profiles. In stark contrast to Boris' immensely popular appreciation group, one Ken Livingstone Appreciation Society has just 100 members and the other more quirky one has just 400! There are at least ten groups set up against Livingstone for every positive one, and if you look at their titles people evidently don't merely dislike him, they despise him. The only group in favour of Livingstone with any support at all is one set up by NUS activists, but it still only has 1,700 members. His campaign team set up an official politician page before Boris' yet it is six and a half times smaller than the two Boris Johnson politician pages. Whilst there at least 250 groups relating to Boris and Livingstone each, there are just five about Paddick - two in favour, three against. He doesn't fare much better than Livingstone in terms of active support, having a politician profile that has attracted 1,500 supporters in five months, a group with 800 members and a profile with almost 400 friends. Overall, there are over 25,000 members/friends of pro-Boris groups. That's roughly ten times more those supportive of Livingstone (whose active detractors massively outnumber his active supporters) and almost nine times more than Paddick. If Boris was twice as popular as the others on Facebook the difference could be attributed to various factors and it wouldn't be too interesting. But, as with our analysis of BBC employees on Facebook (eleven BBC employees self declare as liberals to every one conservatives), the scale of the differential is too large to not be very significant. He clearly has a broad appeal, there are 2.5 liberals to every conservative in UK Facebook network. His popularity with younger people is unparalleled. Let's hope that this strength of self-declared support shown on Facebook translates into votes. 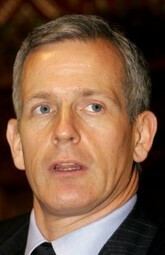 Earlier this week Brian Paddick was confirmed as the LibDem candidate for London Mayor. In an interview just aired on BBC1's Politics Show the former Met police officer reveals that he was approached to throw his hat into the ring for the Tory nomination. He replies "yes" when asked if he means the Conservative Party. Paddick describes Sir Ian Blair an ‘ally of the Labour party’ and suggests, somewhat unbelievably, that the Met Commissioner allowed ‘Vote Labour’ to be painted on the side of a police vehicle. Now, Ian Blair may be biased, politically correct and not-up-to-the-job but he's not that stupid. Surely? Given the Greg Dyke debacle it's possible that the Tories approached this soft-on-drugs policeman but Paddick is largely mischief-making here. "Londoners have had enough of Ken Livingstone; even some of his supporters think eight years is long enough, let alone twelve if he were to be re-elected. The part-time Member of Parliament for Henley-on-Thames, part-time quiz show host, part-time right-wing columnist, is never going to represent Londoners, even if he was prepared to stop playing the fool - which he’s not. I am the only serious alternative to Ken Livingstone and I have the background, the skills and the experience to do the job and do it well. Some might say I am not really a politician, well thank goodness for that! I have a hard-earned reputation for being open and honest, for telling the truth even when it is not what people want to hear. I am not going to throw that reputation away now." The Guardian profiled the gay, "soft-on-drugs" senior Metropolitan policeman a couple of months ago. How much of a threat do you think he will pose to Ken & Boris?